The Package will be set in Paris and unfolds amidst the travels of tourists and the tour guides there, and is looking to shoot entirely in France. 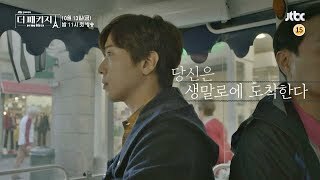 Jung Yong Hwa plays San Ma Roo who goes on vacation alone after getting dumped by his girlfriend. On the other hand, Choi Woo Sik plays Kim Kyung Jae who is an office worker who has dated his girlfriend for 10 years. Yoon Park will portray a mysterious young man who chases after Lee Yeon Hee who is tour guide Yoon So So. Yoon So So studied abroad in France and became a tour guide. As for the rest of the cast, Ha Si Eun is web designer Han So Ran who is contemplating between dating and marriage. Jung Kyu Soo plays Oh Gab Soo who is stubborn, aggressive, and good at fighting. Lee Ji Hyun is Han Bok Ja who has spent her whole life taking care of her ill husband. Finally, Park Yoo Na plays Na Hyun whose age is a mystery.